Did you know that you can quickly view your designs on your mobile device? All you need is the ProtoShare Business Edition and a mobile friendly design. There are a few ways to set up a design to be mobile friend. You can right-click the design you want to change in the Designs pane below the Page Tree in the left sidebar and select “Format as Mobile App”. 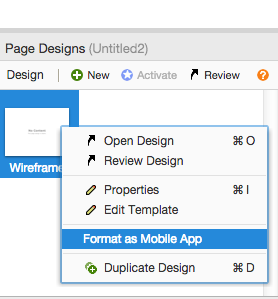 You can also find this option in the right sidebar under the Design Properties pane. Once you are ready to run the design on a mobile device, click the File menu above the canvas and select View on Device. You will be presented with an URL and Pin code that you will access via your mobile device or you can scan the provided QR code that will link you directly to your design. This entry was posted in Blog, ProtoShare Tips & Tricks. Bookmark the permalink.